Use this do-it-yourself guide in order to get rid of YourAdExchange Mac virus, which redirects web browsers and displays deceptive software update popups. YourAdExchange isn’t a Mac-only infection. With a substantial share of compromised users being on the Windows side, the upward tendency is currently about shifting over to the OS X realm as well. This virus basically operates as a browser hijacker that makes Safari, Chrome and Firefox constantly spawn new tabs and windows that present popup alerts to the victim. These notifications, undoubtedly, go bogus on the user as they recommend installing a new version of media player or updating a critical piece of software such as Flash Player while there is in fact no such need at all. 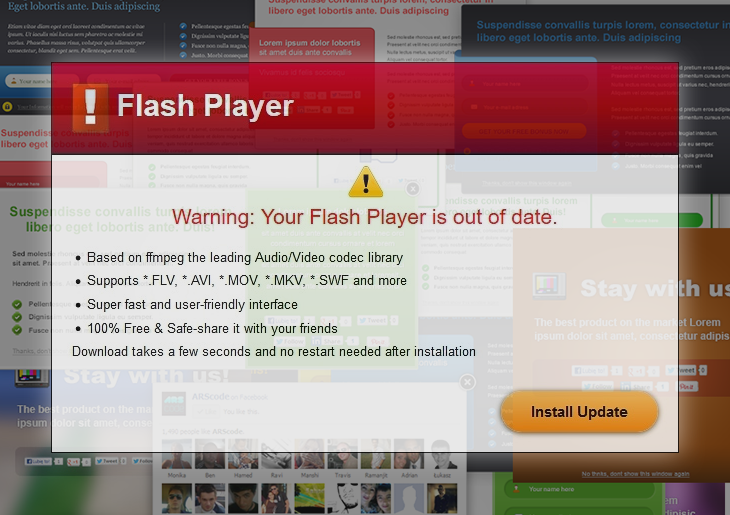 Occurrences of this sort represent the social engineering facet of this adware’s activity. Sometimes, though, the targeted Mac’s admin ends up on landing pages that are legitimate ecommerce websites like AliExpress. One way or another, this pest all of a sudden comes to control the user’s Internet navigation vectors without asking for permission to do so. YourAdExchange.com is actually a higher-level malvertising framework that captures one’s traffic and further redistributes it, therefore the victim might only see this URL within a brief time span while the redirect is being implemented. A couple of domains that appear to be the final destinations are securedownload01.net and chachagong9.com, each having a long, random-looking tail that starts with, ‘info’ and ‘lp’, respectively. The programs that are being pushed on these exasperating pages are not safe, so it’s strongly advised to refrain from clicking the ‘Upgrade’ or ‘Install Update’ button otherwise a yet more aggressive and menacing entity can freely enter the Mac. Users are often perplexed over the way YourAdExchange threat has made it into their Mac box. It turns out that the attack mostly takes place during third-party app installations rather than some state-of-the-art compromise like exploit kit-powered assault. It’s common knowledge that free utilities tend to be ad-supported and promote interested parties’ products so as to compensate for their inherently unprofitable model of distribution. The payload of YourAdExchange clings to such setups, and it suffices the user to overlook one tiny little notice or checkmark to get infected in the long run. Such insecure freeware bundles are a particularly controversial matter because a lot of them are available on app download market places that are generally trusted. YourAdExchange brings about a great deal of web surfing disruption on the infected Mac, and it is known to be involved in far-flung virus proliferation schemes. Necessity of removing this adware, therefore, is out of the question, but it’s efficiency of this process that makes a difference when it comes to the cleanup methodology, so be sure to do this the right way. When confronted with malicious code like the YourAdExchange on Mac, you can neutralize its toxic impact by leveraging a specially crafted system utility. The Freshmac application (read review) is a perfect match for this purpose as it delivers essential security features along with must-have modules for Mac optimization. This tool cleans unneeded applications and persistent malware in one click. It also protects your privacy by eliminating tracking cookies, frees up disk space, and manages startup apps to decrease boot time. On top of that, it boasts 24/7 tech support. The following steps will walk you through automatic removal of the YourAdExchange infection. 4. Check whether the YourAdExchange virus has been fixed. If the lock screen is still there, go to the Uninstaller option on Freshmac GUI. Locate an entry that appears suspicious, select it and click Fix Safely button to force-uninstall the unwanted application. 5. Go to Temp and Startup Apps panes on the interface and have all redundant or suspicious items eliminated as well. The YourAdExchange fraud shouldn’t be causing any further trouble.